Our corporate video is a good presentation of our mission and values. Watch our corporate video to get a good idea of how we operate and what matters to us. Sahathai Terminal’s financial reports is available for downloading here. The Board of directors of Sahathai Terminal Co., Ltd. conducts an annual report at the end of each fiscal year. You can download our Annual Report here. Presentation for an overall view or for brief information of our business. The section reflects information about our major shareholders, based on recent public filings. This section also displays Sahathai Terminal’s dividend policy. Sahathai Terminal issues reports regularly following our shareholders meetings. Here you can download publicly available files related to our recent shareholders meetings. The Code of Best Practice is a policy related to corporate governance to provide a guideline to shareholders, directors, employees and stakeholders of the company. This Charter has been adopted by the Board of Directors to assist the Board and its committees in the exercise of their responsibilities. The Board will review this Charter annually. We have arranged a code of conduct as part of the corporate governance to provide a guideline to directors, managing directors and employees on various topics. We are aware that risk management is a key foundation to achieving our goals. Risk identification and management help and supports us to make better decisions. In addition, the Company has set up Compliance Unit to be responsible for legal risk. Here you can download our Inside Information and Securities Trading Policy. Sahathai Terminal would like to report the Management’s Discussion and Analysis as below. 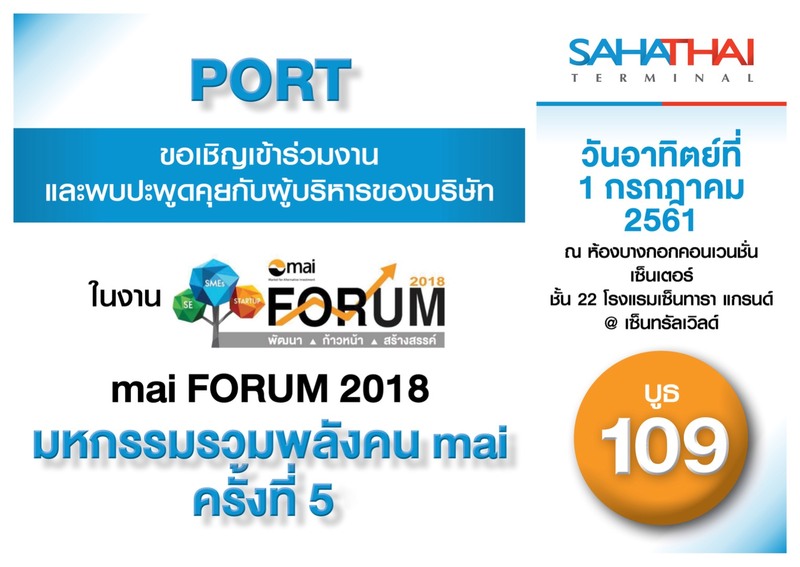 Sahathai Terminal join opportunity day. If you missed the event, you could watch it now ! ! Y 2018 >> 22 Mar 2019 I 3.20 pm. – 4.20 pm. Q1/2019 >> 11 Jun 2019 I 2.10 pm. – 3.10 pm. Q2/2019 >> 9 Sep 2019 I 10.10 am. – 11.10 am. Q3/2019 >> 12 Dec 2019 I 1.00 pm. – 2.00 pm.